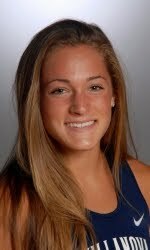 Ariann Neutts was the top collegiate runner at Friday's Haverford Invitational. Neutts led a 6-person Villanova contingent, with five of the six finishing in the top 10 overall. Former Villanova All-American Ali Smith was the overall winner, covering the 3-mile course in 16:51 (5:37 pace).